Against the odds, Mima Ito has become only the second Japanese player to win the Women’s Singles title in the history of the Japan Open following a tremendous six games victory over China’s Wang Manyu (11-7, 12-10, 8-11, 11-7, 6-11, 12-10) in the final of the Seamaster 2018 ITTF World Tour Lion Japan Open in Kitakyushu on Sunday 10th June. 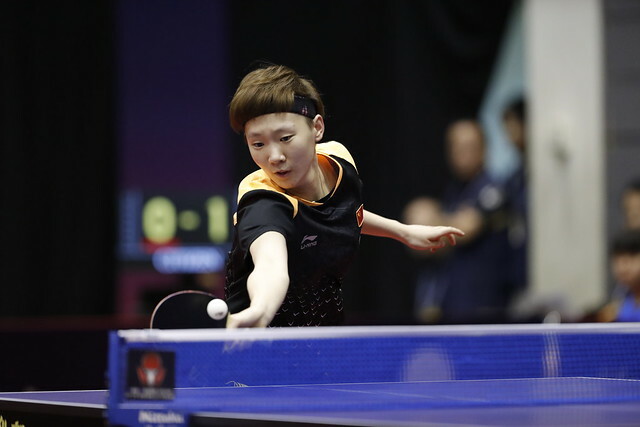 The two players had met on six previous occasions with all five wins going in Wang Manyu’s favour including their recent semi-finals encounter held last month when the ITTF World Tour stopped off in Hong Kong – in Kitakyushu, Mima Ito got her revenge. Taking an early lead with an opening game victory, Mima Ito then recovered from a 5-8 points deficit in game two before going on to double her advantage with a 12-10 win. Wang Manyu needed a response and it came in the following game, claiming the third end by a three point margin but it wasn’t long before her opponent’s two games lead was restored. Once again the pressure was on the Chinese competitor to lift her game and it looked as though maybe the tide was beginning to turn in her favour as Wang Manyu prevailed in game five before going on to hold two game points in game six. However, three points in a row for Mima Ito handed the local favourite a Championship Point which she took with open arms. For Mima Ito success in Kitakyushu marks her first Women’s Singles gold medal on the 2018 ITTF World Tour and is her fifth title in total in what has been seven appearance in Women’s Singles finals. Disappointment for Wang Manyu in what was her third final in the space of three weeks but there are some positives to reflect upon with her victory over Liu Shiwen in the last four guaranteeing her spot at the summit of the World Rankings list, moving level with Zhu Yuling on ranking points.